NECOFA, Slow Food International, and the Central Rift Convivium of Slow Food in Kenya are implementing a community empowerment project, building partnership between small-scale food producers of Central Rift and chefs in Kenya. One objective of the project is to have enhanced access and information sharing, locally and internationally, and one activity towards attaining these objectives is conducting group exchange visits. 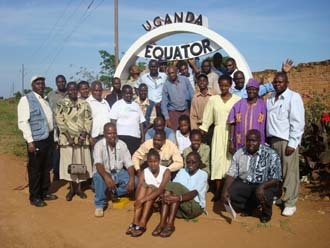 Towards this end, NECOFA, Slow Food Central Rift with support from Slow Food International and Friends of Kenya Schools and Wildlife (FKSW) organized a one week exposure visit to Uganda (2nd-8th December 2007). The 28 (20 farmers and 8 teachers) participants for the exposure trip were drawn from target community group members and teachers in school garden project in the project (Molo district) and community members and school garden teachers from arid Baringo district. During the farmers exchange visit, they learned a lot, particularly that most of their resources are underused and that they don’t require costly investments in external inputs when organic farming is less expensive, producers better products and is more sustainable. Farmers were impressed by organic farming practiced by most of the farmers to maintain the soil fertility, and they were impressed with how farmers were making contribution in the research agenda. The need for sourcing inputs and marketing products as association or co-operative was further emphasized. They also learned from other farmers who are in situations like their own of the need for maintaining high standards of quality and traceability of products that they send to the market. 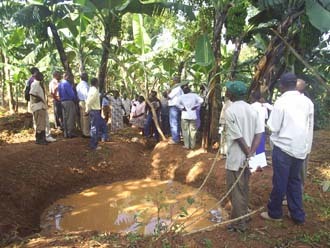 The farmers learned more technologies and skills including water harvesting (run off), which can be used for irrigation during the dry seasons. Farmers networked and shared different experiences and challenges and they learned how the integration of enterprises within a farm adds value to other enterprises. For example, feeding cattle with poultry manure, using dung from cattle to fertilize soils and production of biogas for the kitchen, all of which are very important for small-scale producers because it ensures maximum use of available resources as one enterprise become dependent to the other. 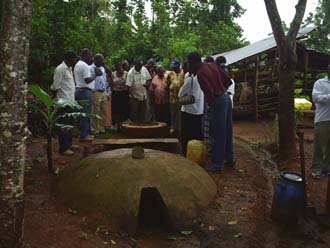 Biogas–The participants visited 2 simple, low cost biogas units at household levels that utilize cattle dung to generate cooking gas and lighting for the families. It was inspiring to see old Mrs. Loyumbya (over 65 years old) who can’t collect firewood benefiting from gas produced from the dung of her 2 dairy cows, with little cost and effort. While the initial investment of biogas is high, the participants realized that they could finance it with credit from revolving funds. Local Poultry Rearing–The Kenyan participants learned simple breeding and husbandry practices that include crossing indigenous poultry with exotic breeds to gain higher growth rate without compromising taste of the eggs or the meat. They learned simple and cheap feeding that includes kitchen remains, an assortment of plant leaves, grains, maggots deliberately raised. Fish farming–One advantage of this enterprise is that it utilizes otherwise not very productive waterlogged land. It utilizes locally available materials and is compatible with other enterprises like local chicken. The fish ponds are fertilized with chicken droppings. Fish are quite prolific and give good returns at a low investment, usually within six months, thus allowing two crops annually. Participatory Research–During the exchange visit, participants interacted with project staff and farmers, and it was quite inspiring. The collaboration between the researchers and farmers creates strong bond between them and demystifies research and technology development. The resultant is a product that both researcher and farmers are happy to be associated with and that they continuously improve. Renewable Energy. Solar Drier–Solar is becoming more and more important in this sector because there is abundance of sun hours and temperatures through out the year. At the farm of Mrs. Susan Nashinji, solar driers are being used for mushrooms, vegetables and fruits, e.g. kale, carrots and jackfruit. This type of drier is quite appropriate especially for farmers and particularly for Baringo farmers to dry their vegetables. Mushroom Farming–This is an incoming crop (algae) that could be grown by our farmers. The Kenyan team visited Mrs. Susan Nashinji who is doing it so simply and at very low costs. Consequently, she can afford to lower her prices and become more competitive in the market. Our mushroom farmers had a lot to learn and even some school garden projects wish to establish such projects in their schools for training purpose, production for consumption in schools, and to generate income. Vanilla–This product is just coming to Kenya and the participants were lucky to visit a cooperative society that has done it for over a decade. They saw it in the farms and learned about husbandry practices especially manual pollination and its dependence on Geotropha trees on which it parasites. The tree is an important source for biofuel. They also visited the factory at (Kisoga) which is in Mukono Distict where they do curing, drying and packaging for export. This plant can be grown in some parts of Kenya but requires high capacity building for efficient organic production. Curing involves use of many new wool blankets and this was found to be a possible opportunity for community members involved in the Molo wool project. The management of NECOFA was asked to follow up. Passion Fruits–This is a common fruit which has high potential and demand in the districts from which the participants came; however, many have failed because of diseases, especially Fusarium ,which has wiped out many orchards. The participants visited the farm of Mr. Haji Zephunya who has succeeded to growing passion fruits and intercropped them with watermelon fruits. The Kenya team felt much challenged. Other Fruits–Among other fruits that are grown in Uganda are bananas, pineapples, mangoes and jackfruits. Many of these can also be grown in Kenya and provide the much need fruit vitamins and income. By any standards you are doing a good job in improving the farmers welfare. I would like to know if you have any membership as i would be interested to get involved.